African heads of state have gathered in Kigali, Rwanda, to sign a free trade agreement that would result in the largest free trade area in terms of participating countries since the formation of the World Trade Organization. Leaders are poised to approve the African Continental Free Trade Area, a deal that will unite the 55 member countries of the African Union in tariff-free trade. The agreement is touted by the African Union as encompassing a market of 1.2 billion people, and a gross domestic product of $2.5 trillion. It is hoped that it will encourage Africa’s trade to diversify away from its traditional commodity exports outside of the continent, the volatile prices of which have hurt the economies of many countries. (September 23, 2015) Today, the U.S. Trade and Development Agency awarded a grant to Senegal Minergy Port (SMP), a Senegalese company created to design, finance, build and operate a new multi-commodity bulk port in Bargny-Sendou. USTDA’s grant will fund a feasibility study to provide SMP with a proposed design, terminal layout and operational plan for the port. The study will also assess the port’s environmental and social impact as well as its financial feasibility, providing SMP with the level of information necessary to secure financing. Read the rest of the release here. The signing of the Cooperation Agreement between the United States and the East African Community (EAC) – a regional bloc comprised of Kenya, Uganda, Tanzania, Rwanda and Burundi – is a major relationship milestone. The agreement shows that the United States and EAC nations are on the same page in terms of the path forward to building local economic growth and further encouraging foreign direct investment in the region. The work tackled after the signing of this agreement will benefit all businesses in the EAC – both local and foreign. June 11, 2015 The Tripartite Free Trade Agreement (TFTA) was signed into effect in Cairo this week, amalgamating three of Africa’s main trading blocs: the Southern African Development Community (SADC), the East African Community (EAC) and the Common Market for Eastern and Southern Africa (COMESA). As well as simplifying Africa’s alphabet soup of overlapping trade zones, the TFTA should boost woefully low levels of intra-regional trade, key to the continent’s economic well-being, African Union trade commissioner Fatima Haram Acyl said. Read more from the American Journal of Transportation here. United States Trade Representative Ron Kirk; the Honorable Richard Sezibera, the Secretary General of the East African Community; H.E. Victoire Ndikumana, the Burundian Minister of Commerce, Industry, Posts, and Tourism; H.E. Moses Wetang’ula, the Kenyan Minister for Trade; H.E. François Kanimba, the Rwandan Minister of Trade and Industry; H.E. Abdallah Kigoda, the Tanzanian Minister for Industry, Trade, and Marketing; and H.E. Amelia Kyambadde, the Ugandan Minister of Trade and Industry are pleased to release the following joint statement, following a meeting on June 14, 2012 on the sidelines of the AGOA Forum between the United States and the East African Community (EAC) Partner States, in Washington, D.C. “Recognizing the importance of strengthening the economic links between the United States and East Africa, our governments jointly resolve to pursue a new trade and investment partnership between the United States and the East African Community. This new partnership will build on the foundations of our existing trade and investment relationship, including the African Growth and Opportunity Act (AGOA), and the U.S.-EAC Trade and Investment Framework Agreement (TIFA). Under this new partnership we will work together to provide new business opportunities to U.S. and EAC firms by reducing trade barriers, improving the business environment, encouraging open investment regimes, and enhancing our two-way trade.” Read the rest of the release here. December 29, 2011 – Ambassador Kirk announced President Obama’s decision to designate 40 sub-Saharan African countries as eligible for AGOA benefits in 2012. During this year’s review process, the President determined that all of the countries currently eligible for trade preferences and other benefits under the African Growth and Opportunity Act (AGOA) would remain eligible and that no new countries would be added as AGOA beneficiaries. November 4, 2011 – Today, the United States launched exploratory discussions during a meeting with the East African Community (EAC) in Arusha on a potential new trade and investment partnership. Ambassador Alfonso Lenhardt, the U.S. 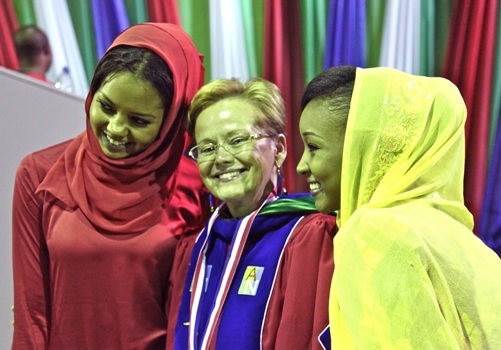 Ambassador to Tanzania who is also accredited as the U.S. Ambassador to the EAC, opened the meeting. Assistant United States Trade Representative for African Affairs, Florie Liser, led an interagency team of representatives from the Departments of State, Commerce, and Agriculture, as well as the United States Agency for International Development (USAID), in the day-long consultations. The EAC Partner States include Burundi, Kenya, Rwanda, Tanzania, and Uganda. Total two-way goods trade between the United States and the EAC was $1.1 billion in 2010, with $632 million in U.S. exports and U.S. imports totaling $437 million. Kenya was by far the United States’ top trading partner within the EAC with two-way trade totaling $656 million, followed by Tanzania with $201 million, Uganda with $143 million, Rwanda with $51 million and Burundi with $17 million. Top U.S. exports to EAC countries were machinery, aircraft, and used clothing last year. Top imports included coffee, apparel, nuts, and semi-precious stones. September 22, 2011 – U.S. Trade Representative Ron Kirk today hosted trade talks with a delegation from the Common Market for Eastern and Southern Africa (COMESA) – the largest regional economic organization in Africa and a key United States trading partner. The talks were held under the U.S.-COMESA Trade and Investment Framework Agreement (TIFA), which provides a high-level forum for advancing a cooperative partnership on bilateral trade and investment issues. During his opening remarks, Ambassador Kirk commended COMESA’s work in advancing economic integration in sub-Saharan Africa. On June 12, 2011 The Heads of State and Government of the Common Market for Eastern and Southern Africa (COMESA), the East African Community (EAC) and the Southern African Development Community (SADC) officially began negotiations for the establishment of a new Tripartite Free Trade Area. The new free trade area will have an integrated market of 26 nations with a combined population of nearly 600 million people and a total Gross Domestic Product (GDP) of approximately US$1.0 trillion. When completed in 2012 the new region will make up half of the African Union (AU) in terms of membership, 58% in terms of its contribution to GDP and 57% of the its total population. The establishment of the new Tripartite Free Trade Area will bolster intra-regional trade by creating a wider market, increase investment flows, enhance competitiveness and cross-regional infrastructure development. For more information about the Tripatite Free Trade Area click here. President Obama gave a major speech addressing a range of political and economic issues in the Middle East and North Africa. 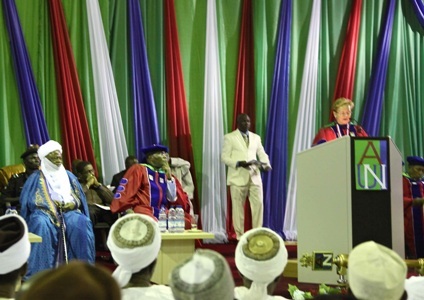 Dr. Margee M. Ensign became the third President of the American University of Nigeria on July 1, 2010. The new President arrived in Yola on July 25, accompanied by her daughter Katherine, to a warm and enthusiastic welcome by top administrators, faculty and staff who all turned out at the airport to greet her.President Ensign comes to AUN from the University of the Pacific in California where she was Dean of the School of International Studies and Associate Provost for International Initiatives. For more information, click here. The Organization of African Unity (OAU) was established in 1963 by 32 independent African States to promote their unity and solidarity and to harmonize, among other things, economic polices. The Economic Community of West African States (ECOWAS) was first formally set up in 1968. A revised treaty was signed by 16 African States in 1993. The principal objective of the Treaty, to be achieved in stages, is the creation of an economic and monetary union.The Heads of State of Algeria, Egypt, Nigeria, Senegal and South Africa were mandated by the OAU to develop an integrated economic development plan for Africa. The New Partnership for Africa’s Development (NEPAD) was conceived in July 2001 as a development framework to promote sustainable growth, improved economic, political and corporate governance.The Common Market for Eastern and Southern Africa (COMESA) began in December 1994 when it was formed to replace the former Preferential Trade Area (PTA) that had existed since 1981. With its 19 member states, population of over 400 million and annual GDP of $360 billion, COMESA forms a major market place for both internal and external trading. Nine of the states are part of a free trade area removing internal trade tariffs and barriers. It is hoped that shortly COMESA will introduce a common external tariff structure and that more of the 19 members will participate.In January 2005, a customs union linking Kenya, Tanzania and Uganda came into force. This is first step towards a common market and will gradually enable goods to pass between the three countries tax-free. The member states hope it will also lead to a common currency and eventually a political federation. In August 2008, 12 African countries established a free trade zone in an effort to improve regional exchange and economic integration. The countries, all members of the Southern African Development Community (SADC), include Botswana, Lesotho, Madagascar, Malawi, Mauritius, Mozambique, Namibia, Swaiziland, Tanzania, South Africa, Zambia, and Zimbabwe. Other members of the SADC are Angola, Congo & Seychelles have not signed the agreement. The goal of the Free Trade Agreement is to make the SADC an attractive area for doing business. On November 4, 2002, the U.S. Trade Representative notified Congress of President Bush’s decision to negotiate a Free Trade Agreement with the member countries of the Southern African Customs Union (SACU). The five nations of the Southern Africa Customs Union are South Africa, Botswana, Namibia, Lesotho and Swaziland. Total U.S.-SACU trade totaled $18.2 billion in 2011.A U.S.-SACU Free Trade Agreement would have built on the African Growth and Opportunity Act (AGOA) of 2000. The California Chamber of Commerce supported the AGOA, which President Bill Clinton signed on May 19, 2000 as part of The Trade and Development Act of 2000.President Bush signed legislation on July 13, 2004 extending the African Growth and Opportunity Act (AGOA) from 2008 to 2015. The AGOA was initially enacted in 2000, eliminating duties on imports from African nations into the United States if those nations made significant efforts to open their economies. In a signing ceremony speech given to members of Congress and the African diplomatic corps, the President commented that the AGOA will create “jobs, wealth and opportunity on both continents.”Then Assistant U.S. Trade Representative for Africa, Florizelle Liser told a Washington audience in September 2005 that, thanks to the historic African Growth and Opportunity Act (AGOA), the nearly $13 trillion U.S. market is wide open to exports from Sub-Saharan Africa’s 37 AGOA-eligible countries. While stating that AGOA has been successful, she noted that its overall impact has been “uneven” across the continent, and she called on African countries to further diversify their economies. Although more and more African countries are taking advantage of AGOA, Liser cautioned that the bulk of the trade act’s positive impact has been concentrated in 12 African countries. South Africa has exported more than 300 diverse products under AGOA. Some other countries, she added, “have yet to export anything under AGOA.” Liser said AGOA has had a “positive impact” not only for African business but for American business as well. A full round of free trade negotiations between the United States and SACU took place in June 2004, followed by several high-level meetings to address issues including investment, intellectual property rights, labor, and the environment. In July 2005, representatives from the SACU and the United States agreed that a comprehensive agreement should be the goal of the negotiations in a sequence of small rounds addressing specific issues. Talks resumed in September 2005 in Botswana, but continued to confront difficulty throughout negotiations. Africa is one of the world’s great emerging economic opportunities. The African Growth and Opportunity Act represents both a symbolic and substantive step in the right direction in terms of U.S.-Africa policy. The Act embodies a trade and investment-centered approach to development. Enactment of the African Growth and Opportunity Act has stimulated the growth of the African private sector and provided incentives for further reform. This Act is aimed at transforming the relationship between the United States and sub-Saharan Africa away from aid dependence to enhanced commerce by providing commercial incentives to encourage bilateral trade. In 2015, U.S. total exports to the AGOA nations totaled $17.5 billion, nearly triple the amount in 2002. In 2015, U.S. direct investment in Africa was $64 billion and investment from Africa into the U.S. was $707 million.